« Day 198 in Beijing: Bye Bye Beijing! 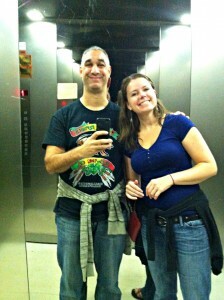 Day 199 in Beijing: Elevator Etiquette. I posted about the number 4 and the elevators in my building on Day 177. Maybe I’m becoming a elevator stalker since this will now be another post about elevators. We are in Kuala Lumpur and we are enjoying the city a lot. It is very beautiful, the people are incredibly friendly, and the food is amazing. 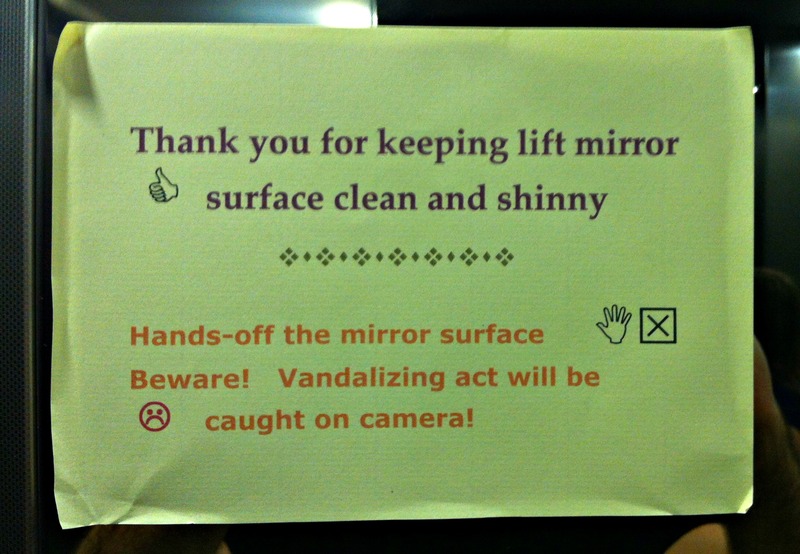 We took the elevator up to our apartment and thought this little note made a lot of sense. Just be respectful, courteous and kind to each other and life will continue quite well. It is something that Jill and I have noticed about Malaysia: people are incredibly kind and generous. I’m sure this is also true of China, and we’ve seen it once in a while, but since we don’t speak the language, and most people in Malaysia speak English, generosity seems a way of life here. We were buying some toiletries we needed. The cashier asked if we had 5 cents, since it was 29.05 RM (Ringgit Malaysia) but we did not. A lady, buying her own toiletries, reached over and gave us 5 cents. This is not a big deal, and it is the kind of thing Jill and I would do also, but this kind of generosity seems to be an everyday occurrence here. Shiny happy people in a shiny happy mirror! Case and point, Alan, who runs the Airbnb apartment we stayed at, took us out to lunch and wouldn’t let us pay. After trying to convince him to let us pay, we told him we will pay next time and he waved us away. We also had a few times, last trip here a few months ago, were we would share taxis with people and they would refuse to let us pay. We did our best to offer to pay them back or take them to dinner but they would often refuse. One of the couples that helped us out told us, “When I was in American, people helped me. Now it is my turn to help you in my country.” They were a muslim couple who were celebrating their 25th anniversary and on the same bus as us when we came into Johor Bahru. They were too busy to have dinner with us that trip but we will be seeing them again and taking them out this time. Anyway, the elevator mirrors were spotless and perfectly clean. As you can see in the reflections.